I can hear your groans now. "Oh, no. Don't tell me he's writing about Woodchuck again." Sorry to disappoint, but yes. I am writing about Woodchuck again. In case you can't tell, I have a fondness for the cidery because (and only because) they tend to brew some of my favorite alcoholic drinks. This evening I'm writing about Woodchuck's autumn seasonal: Fall Harvest. 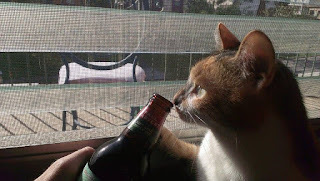 I don't want to spoil too much before you get into my full review of the cider but I don't not enjoy it. I've talked about the Vermont cidery's history before here and I ever-so-briefly reiterated it here. 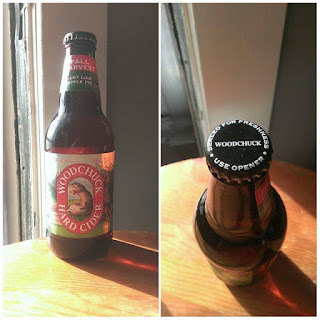 So here's the shortest rundown I can type: Woodchuck, started in the 1990s, can be credited with the cider-craze that is currently shaking the United States. One can see very easily see why this is; their quality is top of the line. That's something that carries into the beverage at hand. Fall Harvest's official webpage states that the cider boast flavors of apple (and, since it's a cider, that shouldn't surprise anyone), nutmeg, cinnamon, and white oak. In addition to that, the bottle says it's "just like apple pie" and has an ABV of 5%. I'll tell you now, however, regardless of how the cider tastes it doesn't smell just like apple pie. It smells like the pie's contents (specifically nutmeg and cinnamon) but not the pie itself. In fact, both noted aromas drown out the apple-y smell that you might expect from the brew. It's not bad, nor is it off putting. It's just unanticipated. To prove that's it's not bad, take Purrl's response. She gave it eight whiffs. That's indicative of a nice-smelling drink! That "just like apple pie" bragging really pays off in the flavor department. I don't know how Woodchuck managed this, but they did: Fall Harvest tastes like honest-to-goodness liquified apple pie. There's a slight bitterness to it thanks to that hint of white oak (which is good; the cider would be too sweet otherwise) but all the separate flavors are expertly combined to create a truly unique and special fall seasonal. There's a light bubbliness to the cider. It'll fizz up your mouth a bit before you gulp it down. But the level of carbonation is just right for something like this. It's a light beverage, and it has the mouthfeel of one. I vividly remember the first time I took notice of my dad making apple pie when I was a kid. At the time, my family was living in Oklahoma. I remember him slicing up the apples for the pastry in the kitchen while I sat at the table intently focused on making sure my Batman coloring book's Batcave was just the right shade of brown. My dad typically doesn't put much nutmeg (if any!) in his apple pies, and as such, that's how I tend to like them. Even though there's a healthy dosage of nutmeg in Fall Harvest, it reminds me of the time that that baking apple pie's aroma filled my nostrils as I made sure to stay within the Batcave's lines with my crayon. Back in May I proclaimed Woodchuck Hard Cider's Fall Harvest to by my favorite adult beverage. Unfortunately (or fortunately, depending on how you view it), that is no longer the case because I've had a few more kinds of beers since then. However, Fall Harvest is still the recipient of the highest recommendation I am able give a beverage: a 10/10. Buy it on sight. Drink it as soon as you have time to truly enjoy it. If you have a friend named Jeff, I guarantee you that he'll love it.